Google has released themes for GMail. Is this really a value add or just window dressing of one of the best web based mail systems out there? What's your favorite? 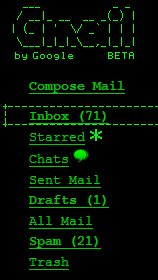 Personally I like Night Shade, but I do like Terminal's retro look. 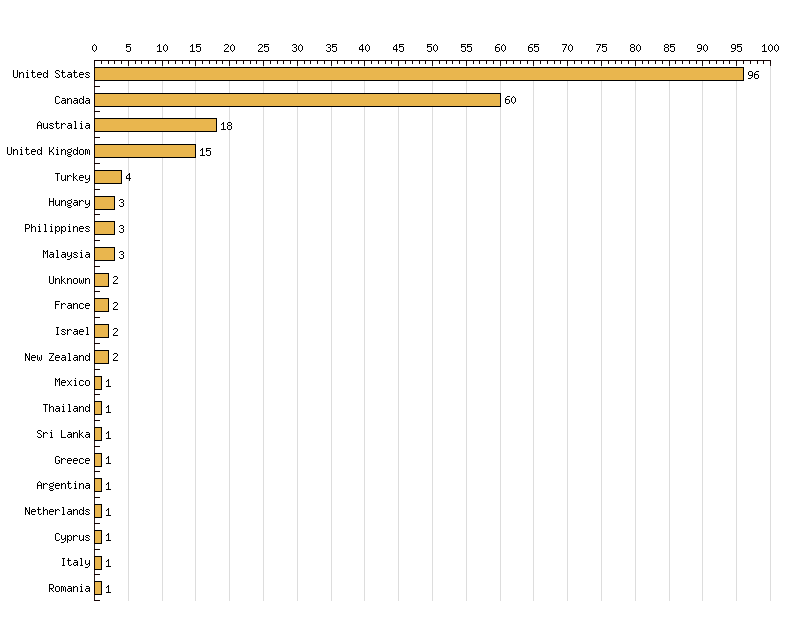 Unfortunately a good indicator of successful for a web 2.0 service is when they are co-opted by business aka the man. 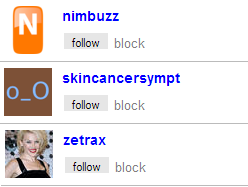 In past weeks I have been friended, added or followed by people / companies on the usual social networking platforms. I don't have any examples from Facebook since they already have all my personal information and can serve up highly targeted adds. I don't know if that's better or worse. But one would think that as the popularity of these social networking services like Pownce, Twitter and VOX push them into mainstream adoption companies will follow the masses to push their brand and win our hearts and minds. Oh and our pocket books. If twitter was around in the 1950's, I'm sure this would have taken it down hard. Even in my short time on twitter I've experienced outages. Thank goodness I don't rely on it like the technorati such as Leo and iJustine. Having just finally signed up with twitter this past week, I can't help but be a little scared that this week's downtime is par for the course. 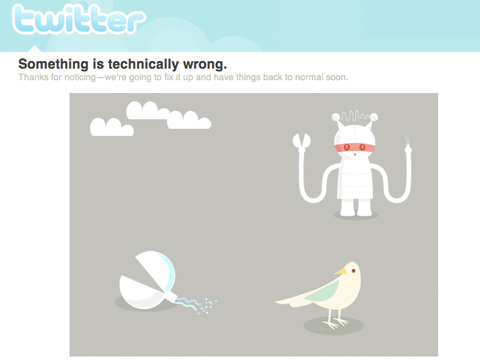 iJustine's post regarding the new error screen on twitter makes me think I might be seeing it quite a bit more often. So I have finally given in to the twitter. I've listened to all my favorite tech podcasts hosts (from Twit & BOL for example) going on about it for months now and I couldn't fight it's web 2.0 allure any longer. Because you know I could always use another social networking tool / addiction. It doesn't help that there is a web application from Thincloud for the iPod Touch there by enabling me to twitter anywhere there is an open wi-fi connection. If any of you are unfamiliar, twitter asks the question what are you doing right now in 140 characters or less. It's a great way to see what your group of friends (or tech personalities in my case) are up too in their day to day life. Also you can set it up with your cell phone and twitter on the go. It's very similar to updating your status on Facebook so everyone knows what you're doing right now. Kind of like stalking but fun for everyone. Did any of you on the book have reservations regarding privacy when they announced in 2007 that public search listings would appear in Google? At the time I personally wasn't too worried about it. Of course who knows what unforeseen privacy concerns might arise from the inclusion of profiles being indexed by the Google. In the end, I'm not too worried since I'm not the first profile of Grant Elliott and there's tons of stuff about me here on my VOX blog. Of course now I'm hurt. Why am I not the first Grant? It's like your first time in a gay bar and you're worried that you might get hit on. Of course no one hits on you so you're indignant they didn't. What I'm not good looking enough to be gay? Oh course they do have a not who you were looking for button so you can see the full list of possible matching profiles. I'll take a wait and see approach. Gmail has rolled out group chat and emoticons and who cares. Have friends who use gmail. Know that there is a chat client in gmail. Are online at the same time I am. While I love gmail and it's ever growning storage, I think I've used the chat maybe twice since they've rolled it out. I'm glad that they make so much cash on their core business (advertising not search) and stock that is a gazillion dollars a share that they can fail and the company survives. Now roll out GDrive so I get some off site back up going and all will be forgiven Google. I've really haven't used my Photobucket account in a year or so, right around the time I signed up with VOX. Coincidence? But my absence hasn't stopped them from rolling out improvements. Like video support. 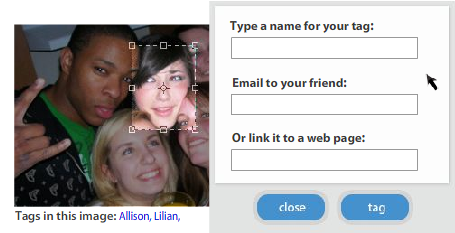 The latest adds the ability to add tags to your Photobucket photos. Very similar to FaceBook, but Flickr has been done that for years. They do have some nice features with this implementation of the tag idea. 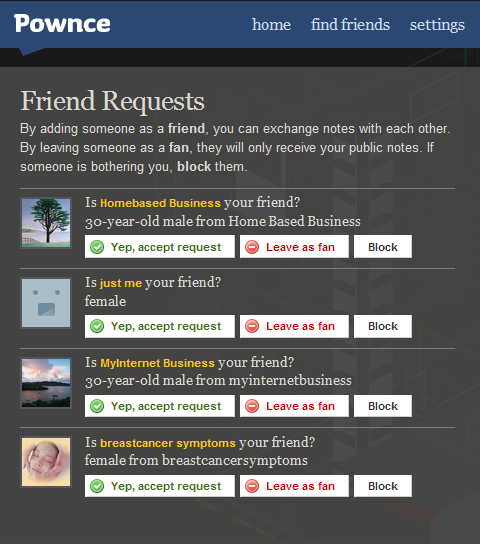 You can tag items or friends, notify your people by email or even link it to a web page. One thing they have over FaceBook is that you can adjust the size of the tag, it's not just a big honking square. Too bad I stopped using Photobucket a year ago. But I still miss it. Back in the old days of Web 1.0, I would keep ZIP discs of programs because 56kps was just too slow to find them again. 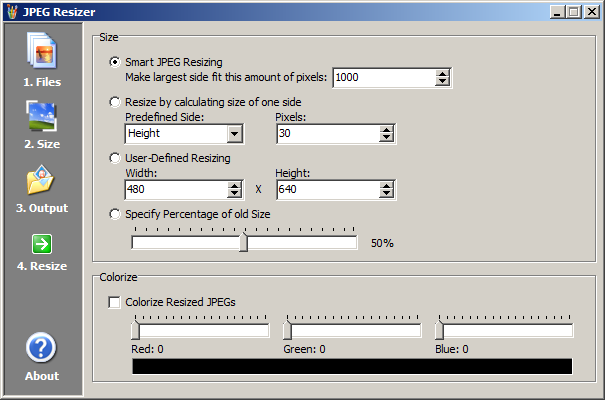 From that time I used an image resizer program called JPEG Resizer. It had lots of features, was simple, fast and best of all free. Their webpage is now gone, replaced by a German site that I have no idea what they do even with using Babel Fish. 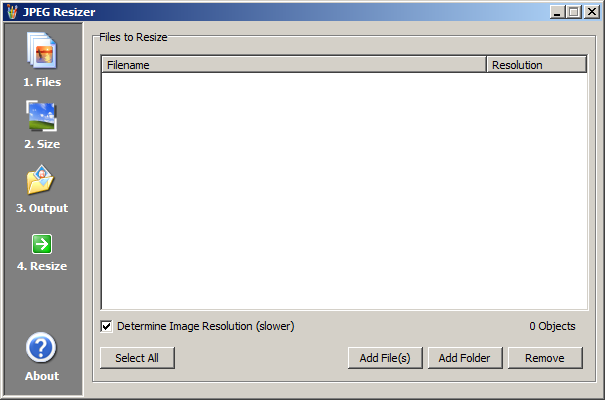 Thanks to Web 2.0 (is there anything it can't do) I now have a replacement called Pic Resize. 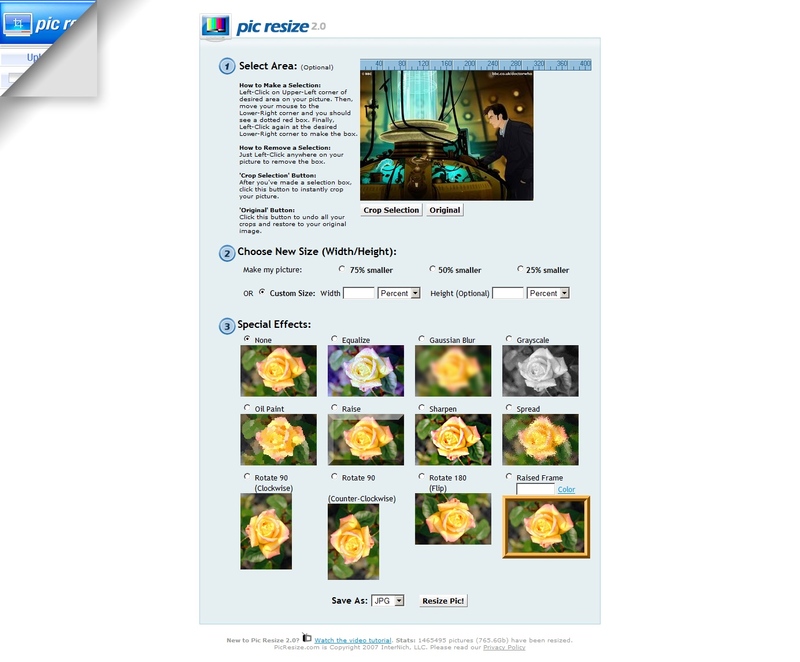 You can upload single or multiple files, crop, resize by percentage or pixel and output as a jpeg, gif or png file. They have a few special effects like gray scale and rotate, just the basics. Let me tell you, it sure beats trying to do resize a photo in MSN Paint. 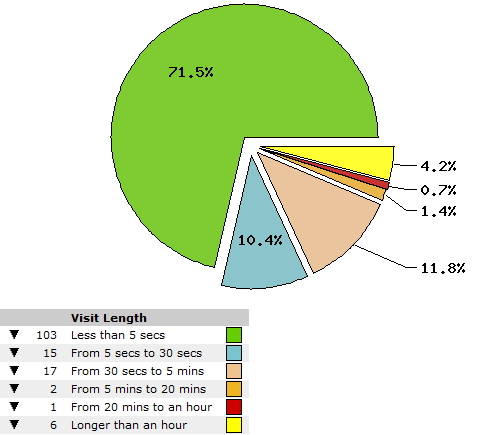 One on the things (ok the only thing) I miss from my old MSN Spaces blog was that you could track stats. Unfortunately VOX (as of yet) doesn't offer any tools for us Voxer's to track stats. Luckily I have two choices that you can add as widgets to your VOX. The first is ClustrMaps (you can tell it's Web 2.0 because it's missing a vowel). You sign up your site address on their site and they provide the HTML code you add as a widget on your VOX. 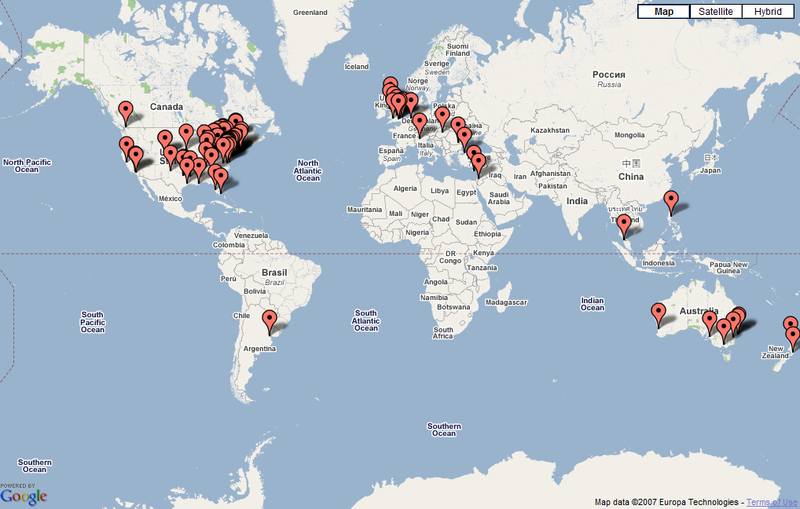 A little map is added to your VOX page and it begins to count visits and even plots visitors on a map. It's pretty limited but it's easy and free. They do have a pro version you can upgrade to but I the free version should be good enough for most of your needs. The second choice is StatCounter. Again you sign up and get code to insert as a widget on your VOX. It's free for the limited version but has way more features than Clustrmaps. And I mean tons. You can track page loads, unique visits, return visits, length of visit, and visitors are plotted on a map but unlike ClustrMaps it's totally zoomable. And that's to just name a few. Oh and you could use these on other sites that allow you to enter code. I'd like to thank my VOX neighbor for finding these. Thanks.